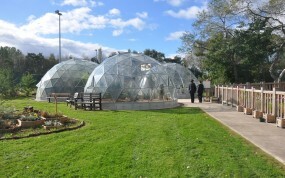 Used in several Universities throughout the UK and abroad, a Solardome® geodesic dome biosphere provides excellent environmental learning and research opportunities. 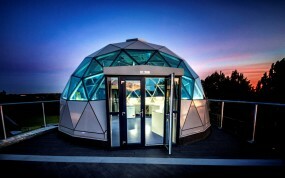 Alternatively a Solardome® geodesic dome can also provide the ideal space for a striking restaurant or cafeteria, unique performance studio or stylish reception. We have two dome ranges for you to choose from. 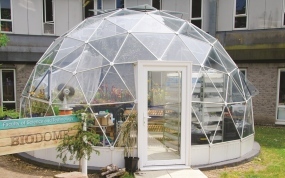 Our standard SOLARDOME® for growing schools glasshouse range, for projects up to 10m, and our SOLARDOME® PRO architectural system, for fully habitable dome buildings from 10m-25m. They provide a multi-purpose setting, and have been used for the study of space structures and engineering, plant physiology, environmental studies and research. The glasshouse is the ideal structure to study the work of American inventor, architect, engineer, mathematician and cosmologist, Richard Buckminster Fuller who demonstrated that the dome is the ultimate way of enclosing space and is the strongest structure available. Domes also make ideal support structures for Astro-physical observations. Responses of herbaceous plants to urban air pollution: effects on growth, phenology and leaf surface characteristics. Honour SL, Bell JN, Ashenden TW, Cape JN, Power SA. Environ Pollut. 2009 Apr;157(4):1279-86. doi: 10.1016/j.envpol.2008.11.049. Epub 2008 Dec 30. Effects of elevated CO2 on the vasculature and phenolic secondary metabolism of Plantago maritima. Davey MP, Bryant DN, Cummins I, Ashenden TW, Gates P, Baxter R, Edwards R.
School of Biological and Biomedical Sciences, University of Durham, Durham DH1 3LE, UK. As an inclusive space that inspires young minds there really is nothing quite like it - we feel it has been a very worthwhile endeavour.